Actually, I never do the CAPTCHA and it still posts my comment. 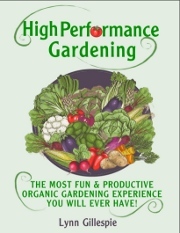 This gardening book sounds wonderful also and such a different slant on the usual gardening books...of which I have a gazillion! Sam, it's the same for me with captcha, but I didn't want to advertise that to potential spammers, LOL It's true though, just ignore it, hit publish, and it works without. I'm glad I'm not the only one who has reduced the size of the garden and honed in on what I can grow successfully and make use of. Just a note about using a refractometer - it measures soluble solids and in most fruit and vegetables that means sugars. So a tomato with 4 brix contains 4% sugar and one with 6 brix contains 6% sugars. It is not sensitive enough to measure the levels of most soluble solids in fruit and vegetables, even though theoretically other things like amino acids are also soluble solids. It is good at measuring the total % of sugars, but not much else. BTW, a tomato with 12 Brix would have as much sugar as a watermelon! Cecilia, thank you for the clarification. Definitely something I need to research. Not so sure I'd like a tomato that sweet, LOL, but I can see how it could help as a measurement toward improvement.